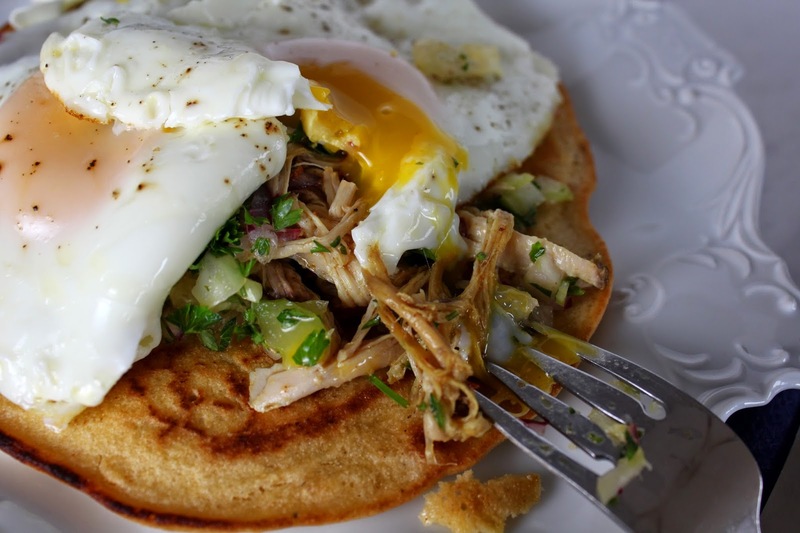 Enter the chickpea pancake, topped with pulled pork, runny eggs and a tart lemon gremolata. Breakfast? Lunch? Dinner? Could be made for any of them, even brunch! When you serve this, don’t mention that this dish is gluten free; nobody will notice. The chickpea flour is filled with protein and gives a really yummy and hearty base for the eggs and pork. This is the perfect dish for leftover pulled pork. Of course you could substitute in chicken or turkey if you like. Lemon gremolata tops the dish with a touch of freshness. Breakthrough the meal time barriers for a Fat and Happy dish. You’ll be glad you did! 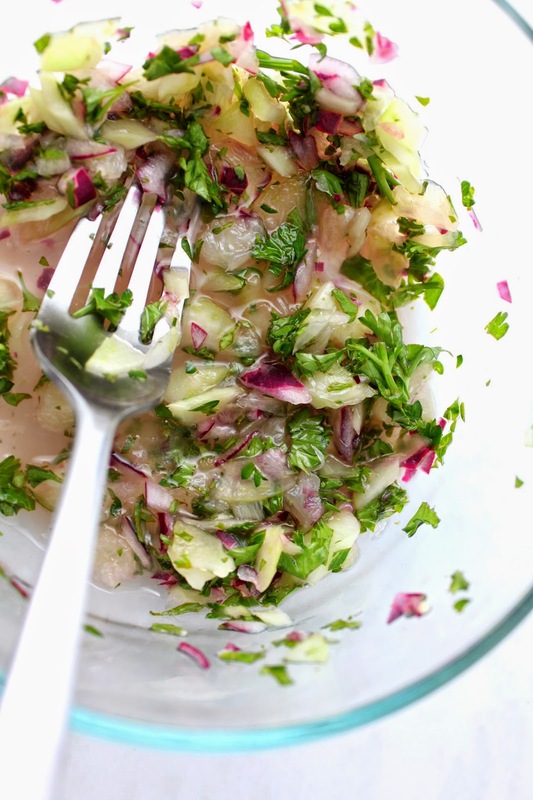 Mix the Lemon Gremolata: Peel and then chop up the entire lemon. Pour in a small bowl, trying to include as much of the juice as possible. Finely chop the red onions and celery and add to the lemon. Chop the parsley and add to the bowl. Toss well and set aside. Warm the pulled pork, if it isn’t already. Whisk together the pancake: whisk the chickpea flour, water, garlic, salt, pepper, baking powder and cayenne. Heat a 10-inch skillet over medium-low heat, add in 1 tablespoon of ghee and melt. Pour the pancake batter in the pan and smooth out a bit. Let cook on one side for 5 minutes. The bottom side should be brown, and the top side will have a turned to a dull finish with popped bubbles in it. Flip and cook about 3-5 minutes until the second side is browned. When you flip the pancake, start the eggs in a separate pan. Melt the remaining 1 tablespoon of ghee in a small pan, add two eggs and cook to desired doneness. Compile the dish: Place the pancake on the large plate or platter. Add the warm pulled pork on top. Top with about half of the lemon gremolata and the two eggs. Serve the remaining gremolata on the side. Happy Healthy Tips: Chickpea flour has a taste of sweet, nutty, bean-like flour. Great to pair with savory dishes.